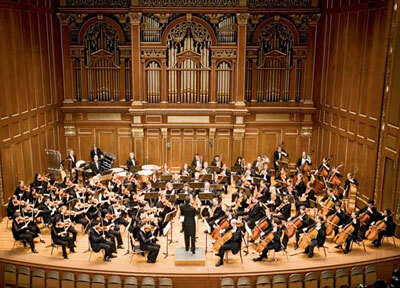 The Longwood Symphony Orchestra performs at Jordan Hall. The orchestra now partners with nonprofit medical organizations for each of its four yearly concerts. (The nonprofit groups buy discounted tickets and then sell them to earn the difference; concert-goers also can, and do, make larger donations.) To date, the LSO has raised hundreds of thousands of dollars for more than 25 organizations, including the March of Dimes, St. Jude Children’s Research Hospital, and the Boston Health Care for the Homeless Program. In 2004 McPhee agreed to become the LSO’s conductor (in addition to his Boston Ballet job). “When I took the group on,” he says, “it was really because I believe in the good work they do in the community and I felt I could help them continue to build their model.” The American Symphony Orchestra League recently took note, too, and gave the LSO the 2007 MetLife Award for Excellence in Community Engagement. This summer, about a third of the group’s 125 members will tour in England, and Wong dreams of someday taking the orchestra to a developing country where the doctors and therapists could practice both their hobby and their professions.